All our lighting There are 87 products. Rocket, airplane, scooter, all means are good for our little adventurer dog! For more information on these light fixtures and the available dimensions, please see the "More info" and "Data sheet" sections below. 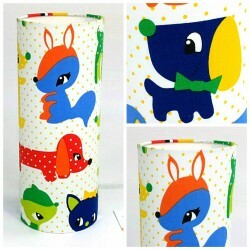 A beautiful lamp for children and teenagers! His funny little sheep remind us of the sheep of the alpine genius! For more information on these light fixtures and the available dimensions, please see the "More info" and "Data sheet" sections below. 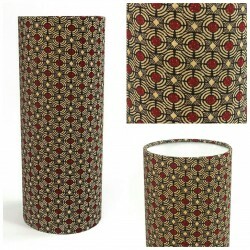 Astypalea is a beautiful light fixture tube in burgundy color. 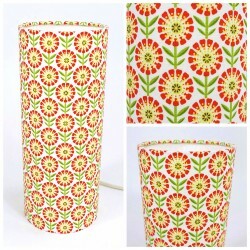 With its birds in flight, this luminaire remind us of the sunsets of a little corner of paradise. For more information on these light fixtures and the available dimensions, please see the "More info" and "Data sheet" sections below. 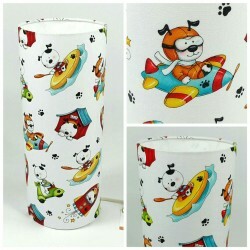 Puppies is a lighting for child in white cotton with small yellow dots representing multicolored cats and dogs. For more information on these light fixtures and the available dimensions, please see the "More info" and "Data sheet" sections below. So chic! 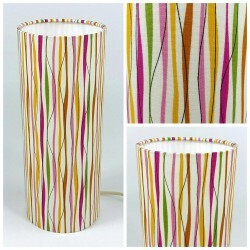 An air of seaside holidays for this multicolored stripes lighting. For more information on these light fixtures and the available dimensions, please see the "More info" and "Data sheet" sections below. The red and brown colors of Africa lignting reminds us the colors of the Dogon country. So let's travel! For more information on these light fixtures and the available dimensions, please see the "More info" and "Data sheet" sections below. 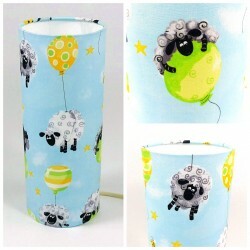 Fireworks on blue sky background, Ines lamp with its shades of blue and red will energize your interior. For more information on these light fixtures and the available dimensions, please see the "More info" and "Data sheet" sections below. 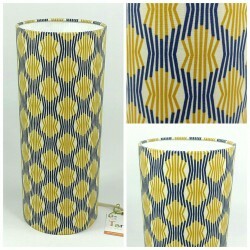 The blue and ocher geometric lines of Athena lighting will bring modernity and style to your interior. For more information on these light fixtures and the available dimensions, please see the "More info" and "Data sheet" sections below. 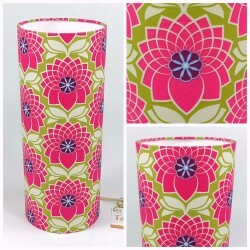 The large pink flowers of Fuchsia lighting and its green leaves bring the spring in your home. For more information on these light fixtures and the available dimensions, please see the "More info" and "Data sheet" sections below. 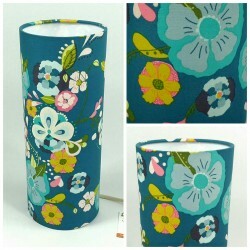 The Blossom lamp: a profusion of pretty pastel flowers on blue background. For more information on these light fixtures and the available dimensions, please see the "More info" and "Data sheet" sections below. The Capucine lighting's orange and green tones will bring energy in all rooms of the house!For more information on these light fixtures and the available dimensions, please see the "More info" and "Data sheet" sections below. 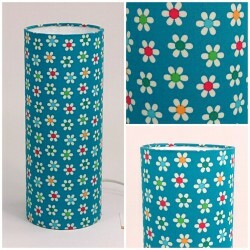 Margot is a lighting for children in blue cotton with many colourful daisies. For more information on these light fixtures and the available dimensions, please see the "More info" and "Data sheet" sections below.